Santa Fe is in the foothills of the Sangre de Cristo Mountains, 7,000 feet above sea level, with 4,800 acres of it devoted to Las Campanas. This master planned community is unique in many ways, not the least of which are the two Jack Nicklaus signature golf courses. Thirty-six holes of world-class golf delivered through the creative genius of Jack Nicklaus. This partnership has created Jack Nicklaus Signature Golf, set within an environment that is unparalleled, and maintained in a manner that is unmatched. It’s your best shot at perfection – Las Campanas. With two courses, members can always enjoy a variety of golf challenges. 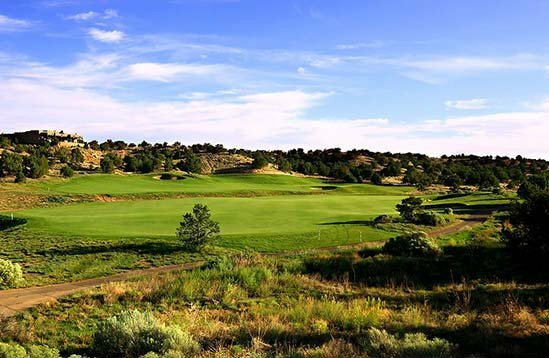 The Club at Las Campanas’ Sunrise and Sunset courses make the most of their eminently playable designs with smooth bentgrass tees, fairways, and greens plus five tee settings – one to suit every player’s ability. PGA-accredited golf professionals are available to help players of all levels enhance their game, and golfers can perfect their skills at the beautiful 19-acre Practice Facility with its large driving range, expansive putting area, bunker facility, chipping greens and a state-of-the-art Performance Center.